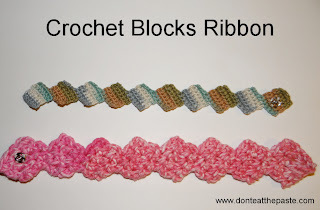 This ribbon pattern is so easy to make, it just uses chains and single crochets to create nice neat rows of diagonally set blocks. I used the ribbons to make bracelets by stitching snaps on the ends. Repeat rows 5-8 for as long as you want the strip to be, on the last block, skip the ending chain 3, and break off yarn to weave in ends. Repeat rows 7-12 for as long as you want the strip to be, on the last block, skip the ending chain 4 and break off thread to weave in ends. you will also need sewing thread, hand sewing needle and sew on snaps. 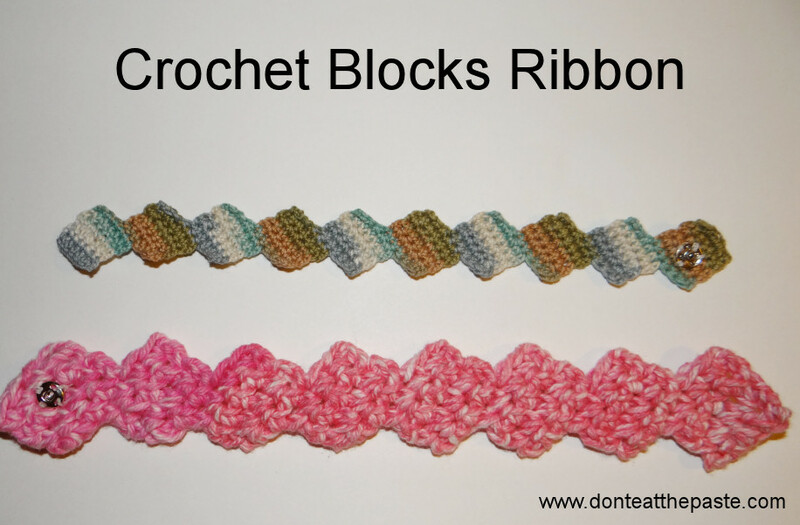 Make strips long enough to wrap around you wrist and overlap one block. For the worsted weight, that wound up being 8 blocks, for the thread it was 10 blocks. Stitch the snaps on each end of the bracelet, with one side of the snap in the middle of one block on one end, then flip the ribbon over and sew the other side of the snap in the middle of the block on the other end. You could stitch the edges together offset by 2 and 3 respectively to make a bangle but the blocks will stretch more that way. Snaps seemed a good option for keeping the shaping without having to reblock every time I wore the bracelet! For the worsted weight, I used a stash yarn in cotton. For the thread version, I used Aunt Lydia's crochet cotton in Aspen. I love how the colorway created pretty striping on the finished project.